We have a new sponsor, Winnie&Walter, for the Curtain Call Inspiration: Clearly Christmas! A randomly selected participant in the Clearly Christmas challenge will receive a $30 Winnie&Walter shopping code, while the LEAD will be invited as a Guest Designer in a future challenge! This challenge is special to me as I am in the design team for both Curtain Call Challenge as well as Winnie & Walter. I am inspired by the colours as we all the gift box from the challenge graphics. Here is my take on the Clearly Christmas inspirational graphics. I have used the Big Bang Sci-fi Star creative screening from Winnie and Walter and silver embossing paste to create my background on the panel. While the embossing paste is drying, I white heat embossed the bear, tiny tag, gift box and gift bag from The Stampets: The gifts stamp set from Winnie & Walter on watercolour paper and watercolour them using the colours from the graphics and let them dry as well. I then die cut a tag out of white cardstock and mini tag out of white and vellum I stamped and white heat embossed “JUST” from the Just for you from Winter Woodland stamp set from Winnie & Walter on the tiny vellum tag. The tag dies are from Wplus9. On the large tag, I adhere a strip of silver glitter paper. Secured the tags using white hemp. Now I cut out the box, bag, bear and tiny tag. The embossing paste is dry. 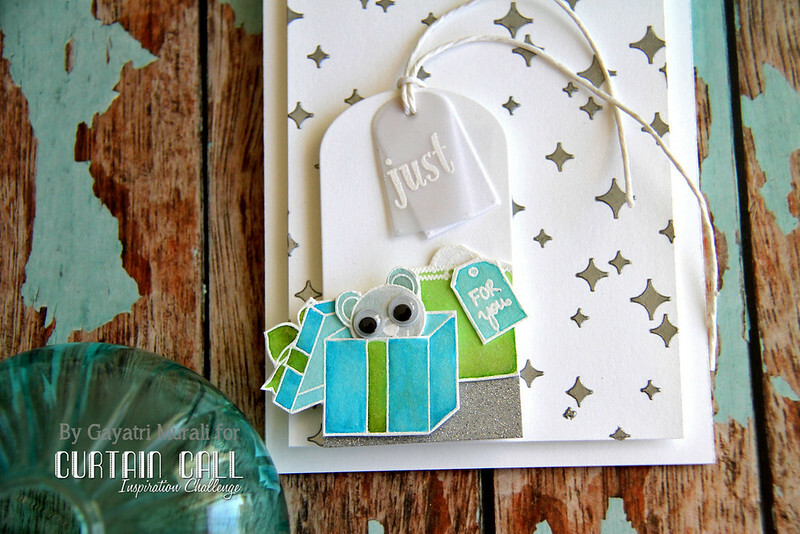 Assemble the card by clustering the bag, box and tiny tag on the large tag. Trim the bear and tuck him inside the box by making a slit with the exacto knife. Add googly eyes on the bear. 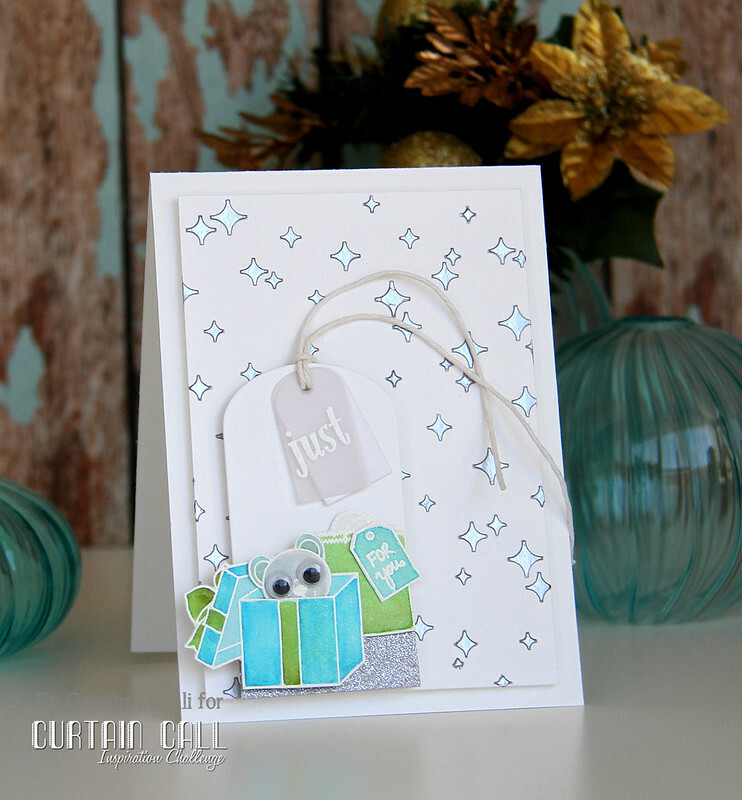 Mount this tag on the embossed panel using foam adhesives. Then adhere the panel on the card front using foam adhesives. 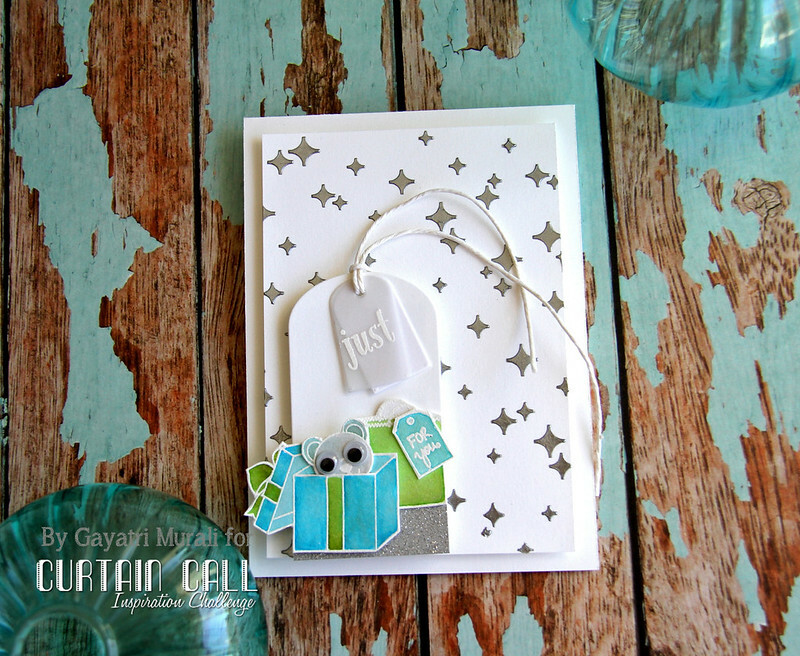 Stop by the Curtain Call Inspiration Challenge: Clearly Christmas for the challenge details and to play along with us! What a sweet card Gayatri. Love the texture paste background and the white embossed images… nice coloring. That little bear is just too cute. Adore the BG and the vellum tag on the tag. Such a fun card, love the peek-a-boo bear!